2. Real life homeschooling buddies/my support group. OK, this might not qualify as an "item," but I cannot imagine being on this journey without friends to walk, run, and crawl it with me or without an incredible support group offering a wide range of activities, classes, and encouragement. 3. Printer/copier, paper, and ink cartridges. It's a bad day when the printer cries "low ink" or "out of paper." 4. Maps. We have a big world map and a slightly smaller U.S. map, and a poster with flags from around the world. We use these extensively. We're on our second world map, as the first one eventually fell apart. When we study specific countries, I print out maps downloaded from #1 by using #3 and put them on #6 and the kids can label them with #5 and 7 and then put them in a #8. See? It all works together. 5. Sharpened pencils and pens that actually work. I never, ever have enough of them. 6. Clipboards. We use them all the time. I like for each subject to have its own clipboard, so my kids can grab yesterday's clipboard that already has a spelling list on it, for example. They also use clipboards for drawing paper, to take on trips, etc. 7. Art supplies, drawing paper, markers, crayons, etc.. My kids are constantly doodling and drawing, especially as we do read-alouds. I would hate for anyone to ever ask "do we have any markers?" We always have lots of everything, and I restock with the back-to-school sales every September July. 9. Tape and glue sticks. Nary a day goes by that we don't have the need for something sticky. We never seem to have enough of these two around. 10. The public library. Need I say more? Yes, we have shelves and shelves of books in our home, but we could never come close to matching the wealth of delicious books and movies at the library. 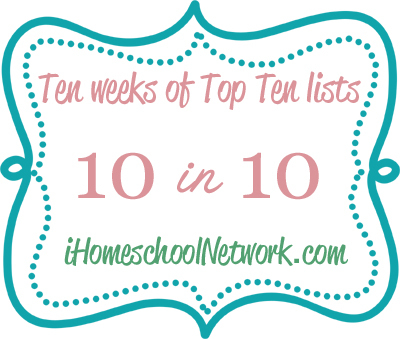 This post is part of iHomeschool Network’s 10 in 10 series and is linked to Top Ten Tuesday. Love #6 for the car! Great list of must haves. Thanks for sharing. Be Blessed. #2 is such a necessity!!!! LOVE YOUR LIST! What would I do without the support and encouragement of my homeschool friends? Great list, thanks for sharing! HI Sarah ~ I think I could have written your list! We are at the library weekly -- my favorite resource! I hate the days when my printer is low on ink or paper too! Enjoyed reading your list! I love it that you didn't mention "the perfect curriculum" because there is no such thing! Your list is great...maybe I'll come up with my own version!